This article is about NPCs who are vampires. For the disease's effects on the player, see Vampire. Vampires are NPCs afflicted with Vampirism. The disease causes them to physically change, giving them pale skin and glowing eyes. Vampires are blessed with supernatural powers but their condition makes them vulnerable to sunlight and fire. Vampires are undead and therefore vulnerable to magical effects aimed at the undead. 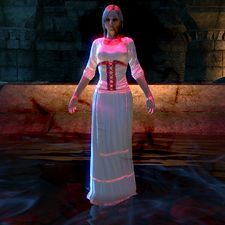 Most vampires encountered belong to the bloodline created by the first vampire herself, Lamae Beolfag (known as Lamae Bal and the Blood Matron). They have powers including invisibility, mist form, and the ability to summon bat swarms. These vampires also become more powerful at night and, like other vampire bloodlines, their abilities become more potent the longer they go without blood (though their regenerative powers become weakened). Vampires of this bloodline cannot be turned by a single bite or a drain spell; instead the victim needs to be exsanguinated and then force-fed the blood of the sire. You can undergo this process in the quest Scion of the Blood Matron, during which you will meet Lamae Bal herself. In terms of weaknesses, these vampires possess the common vulnerabilities to fire, sunlight and silver. However, for some unknown reasons, sunlight does not directly harm them, only spells that harness the sun do. It is possible that the merging of Coldharbour with Tamriel has had an effect on the sun, allowing them to move around unharmed; despite this they still only come out at night. Another theory, proposed by the author of Noxiphilic Sanguivoria, a book about this variant of the disease, the reason why these vampires are not harmed by daylight is because of a deal with Hircine. Instead of a weakness during the day, they are strengthened by the night. However, the author describes as just a wild theory. Vampires can be found across Tamriel, but the highest concentration is in Rivenspire due to the two noble families (House Montclair and House Ravenwatch) there that largely consist of vampires. There are some vampire groups with known names, as well as unnamed covens based in particular areas. This is a list of named factions; for more groups, see the tables further down the page.